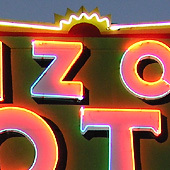 For many visitors to Arizona, their first view of the Grand Canyon State is overhead as they fly into the Phoenix-Mesa metroplex. 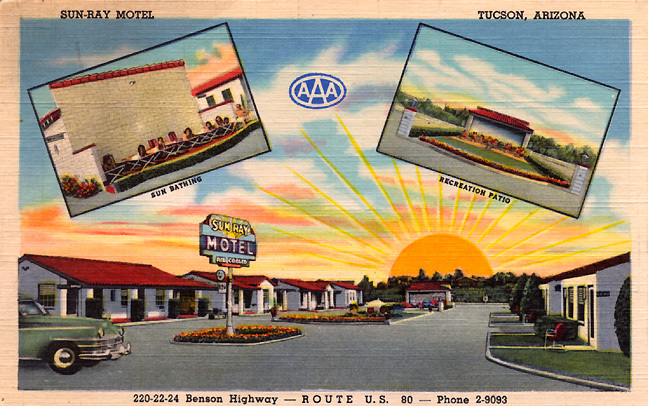 From the plane, they encounter a perfect visual aid for the impact of cheap land and booming population as ever-expanding axes of pavement and heat waves sprawl into the desert, leaving golf courses and video stores in their wake. 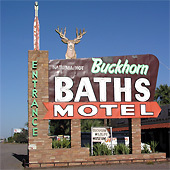 Driving the interstate, you can pass through the exits like ticks of a clock, each the same as before. 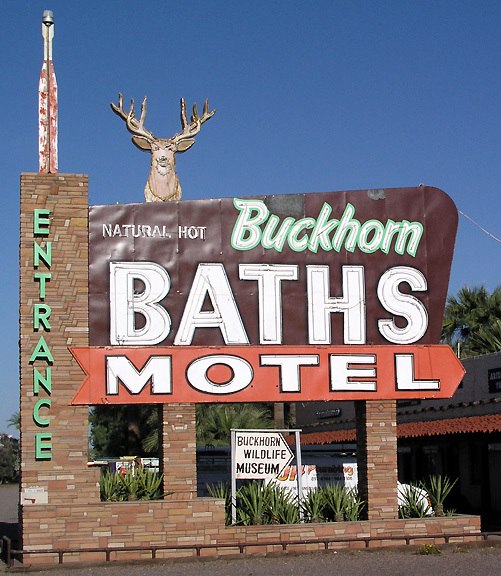 Pull off into Mesa and you’ll discover a surprise next to the faded green shuffleboard court and soupy pool of the tired Starlight Motel: a fantasy of pink and purple as a buxom bathing beauty dives repeatedly into a glistening, electronic splash. 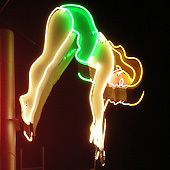 For years, photographers have experimented with their exposure settings in the quest to capture each of the three animated steps in which the diving girl plummets toward the pool. 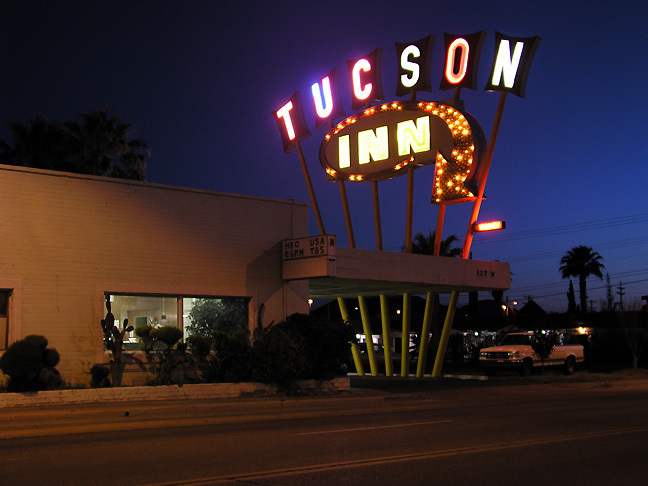 For Arizona’s funkiest vibe, head all the way south to Tucson, a town whose gorgeous neon signs and motel relics are almost perfectly photographed in Abigail Gumbiner and Carol Hayden’s book, Vacant Eden. 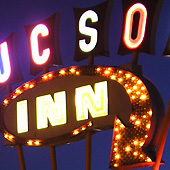 Try not to get run over as you photograph the Tucson Inn with its poles bursting skyward like sunrays. 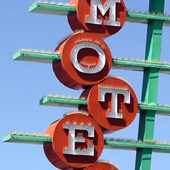 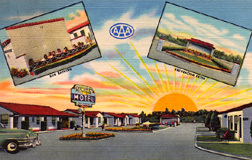 Make sure your seek out the Arizona Motel whose pink and green neon casts an otherworldly glow when the sun sets. 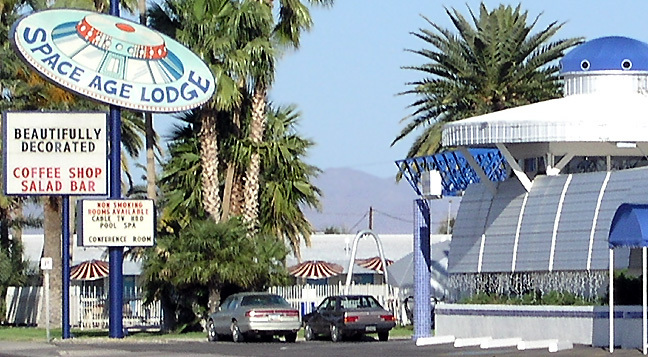 And shuffle quietly past the literally named No-Tel Motel, trying to contain a snigger. 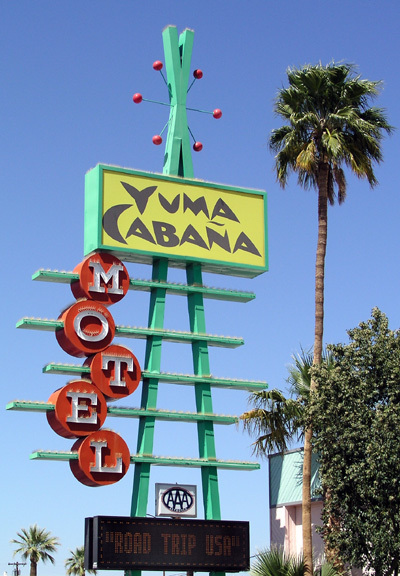 Or, you can loosen your hair for a high-speed burn to Yuma in search of the Yuma Cabana Motel, scorching near the Mexico border. 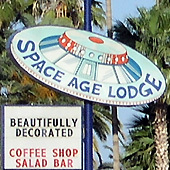 You’ll put down a few more bills, but the rooms are cleaner and the sign calls for a phrase not appropriately uttered since the 1960s: it’s “out of this world.” Laugh now, but when you see it, you’ll understand.